A motorcyclist has died following a crash on the M62 near Ripponden this morning. West Yorkshire Police said they were called to the scene shortly before 11.50am today when a motorbike and car were involved in a collision. A spokesman said he could confirm that the rider of the motorbike had died, but no further information could be provided at this time. 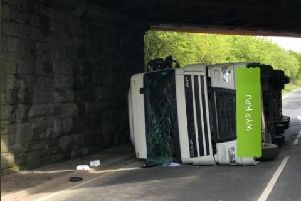 Drivers have been warned that the eastbound carriageway is likely to remain closed between junction 21 (Milnrow) and junction 22 (Ripponden) for several hours.